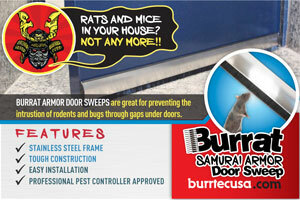 Burrat Samurai Armor Door Sweeps prevent the intrusion of rodents and insects through gaps under doors. The durable door sweep features a stainless steel frame to protect the attached brush, with a company guarantee. Installation is easy, the company says.